I first published this story in the San Francisco Chronicle twenty years ago, and since then a fair number of people have remained convinced that I am the uncrowned queen of matzo balls, or kneidlach, as they are called in Yiddish. I start getting the emails and phone calls from those suffering from kneidlach angst just about this time. I toyed with the idea of a webinar, but it really isn’t my style. So I urge you to read or reread the original “Commentaries” on line. You won’t be sorry. Now the original family history in the commentaries is pretty much cast in stone or scrolls, but I have tweaked the recipe and prep advice to make it even easier, without violating your grandmother’s traditions. Use the store-bought boxed matzo meal. Any boxed meal (whether kosher for Passover or not) will have the texture you need. Don’t grind your own. Use at least some rendered chicken fat and salt in your mixture. The recipes on the box are a response to the cholesterol- and sodium-wary, and the results are pretty tasteless. These days I compromise by using half chicken fat, rendered with onion (available frozen in markets that carry kosher foods) and half vegetable oil and I use about half again as much salt as the recipe suggests for a batch of eight. After all, they are just a once-in-while treat. Moisten the mixture with chicken stock, not water. Much more flavor that way. Make sure the water in your stock pot is at a rolling boil before you lower it to simmer the matzo balls. For even texture and a light but firm consistency when cooked, the raw matzo balls must bob up to the surface of water almost immediately . Then you cover and simmer them. If the water drops temperature too quickly, this can’t happen. It’s the soup that counts. 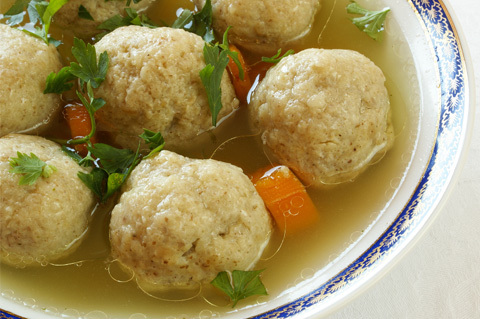 Matzo balls are a tasty but lightly flavored dumply, complemented by a really flavorful soup to float them in. It doesn’t have to be the traditional chicken soup. Yes, you can freeze the matzo balls. The best way I find is to freeze them in containers with plenty of clear, defatted chicken stock or other clear soup. Then you can defrost in the fridge and heat them in the soup before serving. If you make them ahead of time, you can store in the soup in the fridge for a day or so. Just be sure they are covered with liquid so they don’t stick together. Most, important: Be not afraid. These kneidlach have traveled across deserts and oceans. They are made to endure.